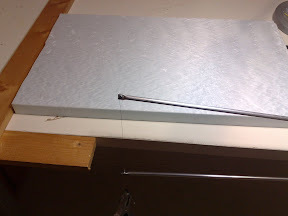 I'm building the box that will contain the balloon's payload out of a polystyrene sheet. Polystyrene can be bought in construction supply stores such as Leroy Merlin in Europe, maybe Home Depot in the US. I've got a 160 x 60 cm sheet for about 2€ from Leroy Merlin (you have to go to the construction supply area, not the main shop). You can cut polystyrene with a regular knife, but the easiest way is using a hot wire. At the right temperature, the wire melts the foam like butter, leaving the cleanest cut behind. And best of all, with no fumes! Car battery, or something capable of delivering 3-4 amps at 9-12 volts. I used my car's old battery. It won't power the starter, but it definitely melts the polystyrene. A couple of battery cables with clamps. 2 aluminum rods. 1 m long, 6-8 mm thick is enough. Hollow ones are cheaper, lighter and better. I've got them from a local hardware store for ~1.50€ each. Small machine screws and bolts. I used 3mm across, 12mm long screws. Two vises. Mine are small, the ones that will hold on to the bench with a clamp, rather than screws. Drill or dremel tool. And a 3mm bit. First, clamp the vises to the bench, one facing up and the other facing down. These will hold the rods. 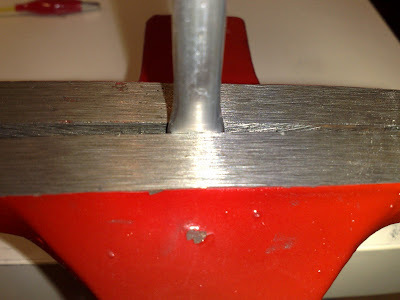 Use one of the vises to clamp and flatten the tip of the rods. Just flatten the last 1-2 cm, this will make it easier to drill through it. Cut the nicrom wire. The wire acts as a resistor, and the shorter you cut it, the hotter it will get. Hotter will cut the foam faster, but it does not have to be incandescent. In fact, if it's too hot, it can break. So it's better to err on the generous side, and if it doesn't get hot enough, you can cut it shorter later. I used about 50cm. My wire looked like a spring, so I decided to straighten just 15-20 cm and leave the rest coiled up. 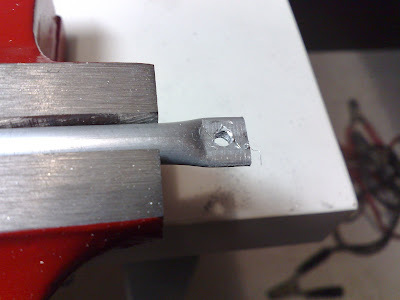 Drill two holes with the 3mm bit on the rod's tips. Insert a screw through the hole and secure the nicrom wire to the rod with a bolt. Do it with both rods. The total length of the wire between the rods is 15-20 cm, so I have some coiled-up wire overhanging. 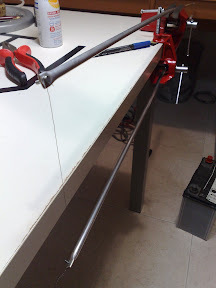 Clamp the two rods, one with each vise. Make sure the wire is tight. 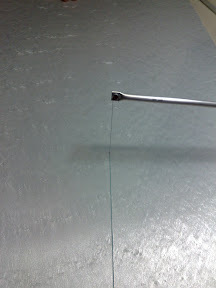 The aluminum rods are very flexible, so just tighten the wire until the rods bend a little. Also, make sure the wire is at a right angle with the bench. 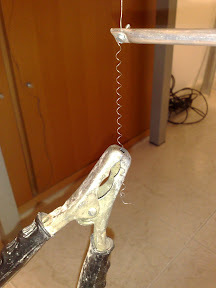 Try to straighten the wire as much as you can (at least the stretch that will cut through the polystyrene). Just press it between two fingers and slide the fingers down repeatedly. Make sure the rods or the vises don't touch each other, or they will short the battery! Now, hook up the cable clamps to the battery. 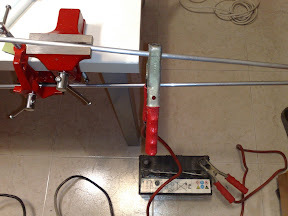 You can try connecting the clamps directly to the rods, but the stretch of wire between them will probably be too short and the wire will get glowing hot in seconds. 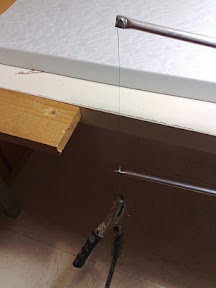 So I chose to hook up one clamp to a rod, then the other clamp to the overhanging wire. Just remember the closer the clamps are on the wire, the hotter it will get. That's it... Use a plank as a guide (sort of like a T-square) if you need parallel edges. You can clamp the plank to the bench, so that you don't have to hold it and can focus on the cutting. Try not to stop as you cut, or you'll start melting a hole around the wire (check the fourth picture below, can you see the dents?). Just keep constant speed. You'll be surprised how extremely clean the cut is! Please, could you post some extra considerations about the reasons why you chose the ArgentData over the Radiometrix? Actually, I think I will be using the Radiometrix HX1 module, since it is much cheaper and this is my first flight, so I won't be throwing away too much money if I lose the payload. The MX146 is, in any case, a superior device. It can operate on multiple frequencies, and it can put out 500 mW (vs HX1's 300 mW). One known problem with the HX1 is that it drifts a lot with temperature. I don't know about the MX146, though. The thing is that a lot of people has used Radiometrix on balloons before and it's a proven technology, so I'm going to go with it. One thing I don't like about the MX146 is that the 8v version is pushing its PA stage to the limits, and can only withstand a few seconds of transmission. You will really burn it if you leave it keyed by mistake. Not a huge deal, but you have to be very careful with this. 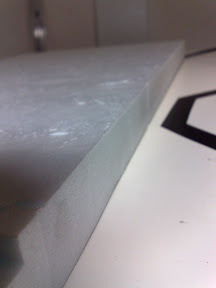 Thanks for sharing this great technique of polystyrene cutting. We all knows the use of polystyrene material in our daily use. The cutting method you have shared above is best to cut every type of Polystyrene Sheet. I personally tried this method and appreciate your shared information about this technique. không ai không biết. Long thần, vốn chỉ là một Chân thần bình thường ..
- À, ta mang theo Thần Long giới chỉ đến đây, chẳng lẽ việc này có gì lạ? giới tử không thể có thêm một cái bên trong nó nữa . - Vậy Long thần làm sao mà đem giới tử này xuống nhân giới được chứ ? đem giới chỉ này đi qua tận Ma giới cơ mà . năm nữa, Long thần rất có có thể trở thành Chủ thần không gian kế tiếp. Long thần giới của hắn đi lại. - A tu la trả lời .